Golf between fathers and sons can be a lot of fun (it can be fun between mothers, daughters, and other family members as well). We have a great 9 hole golf course near us that offers clinics and camps for kids and has a driving range for practice. Also, the course is very friendly to new golfers who don't have to feel overly anxious about their first few rounds on a golf course. The game of golf is a life long sport to be enjoyed. This course promotes this sport and encourages new players of any age to get involved, learn the game, and improve their skills. 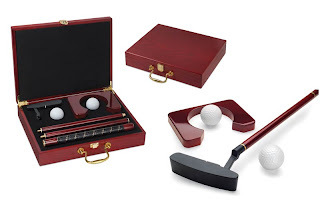 The featured putter set would be a great gift idea for Dad to allow him and the family to practice their putting at home.